This is the next section in my continuing series of early Ocean Beach history, as we investigate the “true” birthday of OB and review the contenders for Ocean Beach’s “founder”. In Part One, I discussed the different possible birthdates of Ocean Beach and highlighted the different theories, the main one being that OB’s birthday stems from a celebration of a land rush event by developer William Carlson and his partner Frank J Higgins on April 24, 1887. Significantly, Carlson and Higgins had named their paper map “Ocean Beach”, which paved the way for what now is the conventional wisdom and official declaration that Billy Carlson is the unquestioned nominee for the category of Founder of Ocean Beach. Yet in Part one, I also highlighted a land developer by the name of J.M. DePuy who actually developed plans and survey maps in 1885 for a sub-division in what is now northeast Ocean Beach – a full two years before Billy Carlson and Frank Higgins filed theirs. So, where does this leave us? While placing the issue of just exactly when OB’s birthday is aside for awhile, let’s discuss who is the Founder of Ocean Beach. What is a “founder”? Just who or what is a “founder” of a community? Seems we have to take a moment for a divergent dictionary trail first. The dictionary says “a founder is one who founds or establishes”. “Found” naturally is the past tense of “find”. And now we have “find” which is “to come upon often accidentally : encounter”; “to come upon by searching or effort; to discover by study or experiment; to obtain by effort or management.” These fit – maybe. It also includes “to discover by the intellect or the feelings”; and “provide, supply”; and finally “to determine and make a statement”. But what about going back to the original “founder” definition and look at “establishes”. Here we have “to institute (as a law) permanently by enactment or agreement”; “to make firm or stable”; “to introduce and cause to grow and multiply”; “to bring into existence”; “found”; “bring about, effect”; “to put on a firm basis”; ” set up”: “to gain full recognition or acceptance of “; and finally “to make (a church) a national or state institution”. Okay, these are definitely suitable and provide a base upon which to judge who the “founder” of Ocean Beach really is. 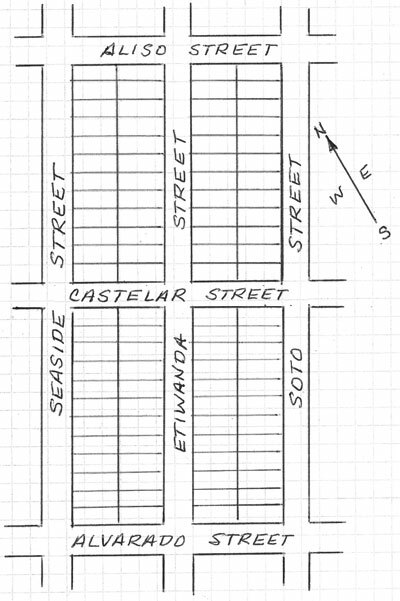 This is a rendering of the DePuy Sub-division in what is now northeast Ocean Beach with the original street names. “Aliso” was changed to Valeta, “Alvarado” to “Greene”. 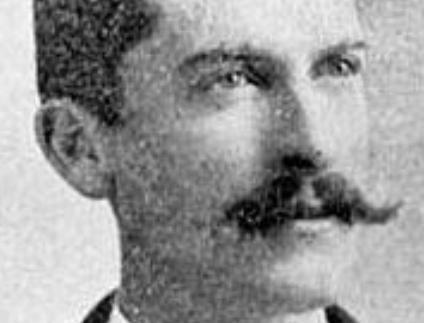 … not much information is known about him, except that he was a lawyer, a land developer, and had been in San Diego at least by 1884, as DePuy was recorded as having purchased over a dozen blocks of the north end of Horton’s Addition along with a partner named Charles B. Van Every that year. (See our earlier posts here and here.) We then can’t possibly consider him “The” Founder, now can we? This brings us back to the presumptive candidate for Founder of OB, William Carlson. What do we know about Smiling Billy Carlson? We know that Carlson – along with his partner Frank Higgins – named their subdivision “Ocean Beach” in 1887. We know he was a two-term mayor of San Diego – and that he later ended up in federal prison for mail fraud. That’s a broad outline. What else? What sources are there on Carlson? 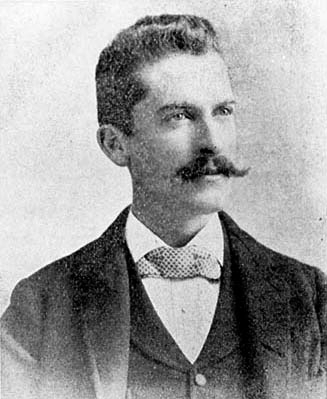 William H. Carlson got an early start, and at the age of 23, was already involved in real estate – he had an office on Fifth Avenue in downtown San Diego. One source noted that he had been former legislative page boy. We do know, thanks to research during the 1970’s by Dennis Doyle, that in 1886 Carlson placed an advertisement under the real estate section of a local San Diego directory, where he described himself as involved in real estate, insurance, land brokerage, he owned lots in Cor0nado (not developed yet) and that he also owned cattle ranches in other locales in California. Huge claims for someone that young. Meanwhile, the man soon to be Carlson’s partner, Frank J. Higgins, had already incorporated the Ocean Beach Company, the Ocean Beach Hotel Company, and the Ocean Beach Rail Road Company. Higgins didn’t live in Ocean Beach – no one really lived in Ocean Beach back then. When these two partnered up – they created the sub-division of Ocean Beach. In April of 1887, they purchased what they called the Ocean Beach tract – a tract of wild hillside somewhere between 300 to 600 acres. It included the land now known from Brighton Avenue south to Point Loma Avenue, and the land between the ocean east to Froude Street. Previously, the area had been called “Mussel Beds” and had been a popular picnicking spot for San Diegans living in Old Town. But in order to get to what became known as OB, it often took a half day trip by horse or carriage across mud flats and rocks from either Roseville on the bay side of the Peninsula or from Old Town itself. There weren’t houses yet in the area except a couple of shacks. The partners hired a land survey company, laid out the lots and blocks, and named the streets – many of which are still retain those original names. As soon as they had bought the tract – and before the survey map had been completed – Higgins and Carlson began extolling the virtues of what they called “the Garden of Eden”, and began selling land in OB. Land Rush Celebration Held in April 1887 – Is this OB’s Birthday? The duo then began planning their actual shindig – a huge celebration for late or mid-April at the beach, complete with a mussel roast, a band, free ice cream, bathing suits – all to entice visitors, tourists, and potential residents – but most importantly – to attract land buyers. Their lots went on sale for $60 – $20 down and the balance in a year. “Prospective buyers agreed that [Ocean Beach] was a nice place to visit, but would anyone want to live there? There was only one rutted road leading there from San Diego and it took half a day to make the trip. Billy was undaunted,” as he promised that there would soon be a railway. One has to understand the history of San Diego’s desperate efforts during the late nineteenth century to acquire a railroad in order to appreciate the absolutely outrageous and absurd nature of this claim. It was simply a complete fabrication – clearly meant to misrepresent the status of local access to railways to potential buyers of the OB lots. Bowers described that the April 24th celebration brought “out huge crowds”. “Lots” she said, “were for sale … – and 2500 were said to be sold that day alone.” On August 21st of that year, the partners held a second barbeque “at which 4,000 lots were sold, even though the price had gone up to $300.” This now seems to be quiet an exaggeration as there were only 4100 lots to begin with. On May 28, 1887, Carlson and Higgins filed their maps of the plans for their subdivision – and they’re actually still part of the official maps of OB. Each of their blocks had 48 lots and there were 86 blocks in the tract. Landmarks on the map included the Mussel Beds from Narragansett to Santa Cruz, Abalone Cove at the foot of Del Mar, Rocky Point at the foot of Pescadero, and Sea Bass point at the end of Bermuda. The partners introduced the idea in full page ads that “Ocean Beach is the Garden of Eden”. On January 14, 1888, Carlson and Higgins reached their peak in splendor and hucksterism by sponsoring the ‘Grand Excursion’ from Los Angeles for prospective buyers. Everyone was trying to get in on the great land boom of Southern California during the Eighties. San Diego swelled with tourists, the curious, land-speculators, and hopeful new residents. Despite the lack of industry and only a few farms, San Diego’s population had grown from under 3,000 in 1880 to 40,000 by the winter of 1887. The city’s boom economy seemingly consisted of speculators selling land to other speculators. Four hundred realtors were busy subdividing enough lots for the population of one million that some zealots were predicting for San Diego by 1900. Nearly one year to the day after the grand celebration in April 1887, William Carlson’s San Diego, Roseville & Ocean Beach Railway “made a successful run all the way to Ocean Beach”, recites Carol Bowers. She was being kind to Carlson and Higgins. Carlson had promised OB land buyers that there would be a railroad to OB, and he apparently placed a lot of time, energy and money into building some kind of railway to OB. Despite all the promises and travel guide listings, it wasn’t until March of 1888 that the railroad was constructed. But it had been built hastily and poorly engineered. And it had so many troubles. Carlson’s first problem began with leasing a steam engine for his line at $25 a day. Another challenge was getting the engine to Roseville so it could be used as no barges were large enough to transport it across the bay. Carlson then was forced to dismantle the engine in order to take it by horse and wagon. However, the wagon got stuck in mud flats near Old Town – and this all delayed the opening of the railway. According to a full page newspaper ad, the railroad was to run from Roseville through Wabaska Canyon (where today Nimitz Blvd goes north from Loma Portal down to nearly sea level) over to Ocean Beach. It was to continue over a bridge to Mission Beach, PB, La Jolla and Del Mar. Carlson soon sold the franchise and nothing past OB was ever built. As the short line was being completed, Carlson sponsored his first founder’s day celebration to be held some time after the arrival of the first train, which did arrive finally at 4 a.m. on the morning of April 17th, 1888. News accounts reported that the train took four days to travel the 3 and half mile length of track. It took so long because of the poorly-laid tracks and borrowed equipment. “The rails were apparently way too light and the ties were spaced 6 to 10 feet apart and had been rapidly and poorly laid,” Doyle recounts. Bowers felt that the completed railroad “redeemed” Carlson’s reputation, “and the anniversary celebration went on as planned, this time with Carlson and Higgins aloft in a hot air balloon over the Cliff House ….” She felt his reputation had to be redeemed because of all the accusations of fraud that seemed to follow Carlson wherever he went. The first founder’s day celebration “generated much publicity for Carlson,” says Doyle. Distinguished speakers included an Assemblyman, a court officer, and Alonzo E Horton – the “father” of San Diego. Carlson did try to revive his railway in 1890, and one story has him traveling to Salt Lake City to find investors for his OB line as well as other paper railroads; he mentioned a few prominent San Diegans implying their sponsorship, but once the Mormons checked, they found no such investments. Yet, railroads remained in Carlson’s plans … despite what happened in 1888 and 1889. During 1888 and the next year, the land speculation bubble in Southern California burst – which was part of a significant and long-lasting national recession during those years. Carlson did go on and enter elected public service, first as County Assessor and then as Mayor of San Diego. His exploits as mayor will be part of the subject of Part 3 of our Ocean Beach history lesson, and search of OB’s true birthday and founder. 1. History of San Diego, by William E Smythe, “Part Five: Chapter 11 Political Affairs and Municipal Campaigns, Journal of San Diego History. 2. The Town That Wouldn’t Give Up, Chapter 15; The History of San Diego. Journal of San Diego History. 3. San Diego’s First Railroad, by RA Middlebrook and RV Dodge, the Journal of San Diego History, 1956, Vol 2, No 1. 4. Boom-Town Ocean Beach and the Great Land Rip-Off, by Denny Doyle, OB Rag, 1974. 5. Mystery Man of Ocean Beach, by Rhoda E Kruse, the Journal of San Diego History, 1977, Vol 23, No 4. 6. How Old is O.B. ?, by Ruth Varney Held, The Passing Parade, by the OB Historical Society. 7. Our Founder: Smiling Billy, by Carol Bowers, The Passing Parade, by the OB Historical Society. 8. In the Beginning …, by Pricilla McCoy and Sally West, The Passing Parade, by the OB Historical Society. 9. The Next Little Dollar, by Mike Davis, in Under the Perfect Sun, Mike Davis, Kelly Mayhew and Jim Miller, 2003. I am not sure who actually founded Ocean Beach, but I am still going with the 1916 FLOOD as the main reason it is the Laid Back Hippie Town I love to live in. Okay, OHD, who was it who made the flood, what movie was made of the incident, and who played the main character? Well Frank, some say it was some rainmaker dude in San Diego. No movie yet, but heck Pat James and I are still working on something for July 4th 2013. Hey Chris – read it – but what is your reference here?